We’re excited to announce that our new £6M summer campaign has launched, entitled “Outside is Ours”, which looks to unlock the feeling of the best of times outside with friends. Our new advert depicts beautiful aerial sculptures being swept up into the sky by a desert wind, acting as a striking visual metaphor for how we all come alive when we’re enjoying our time together outside. The marketing campaign acts as a rallying cry encouraging people to claim the outdoors in time for summer for good times and making memories. 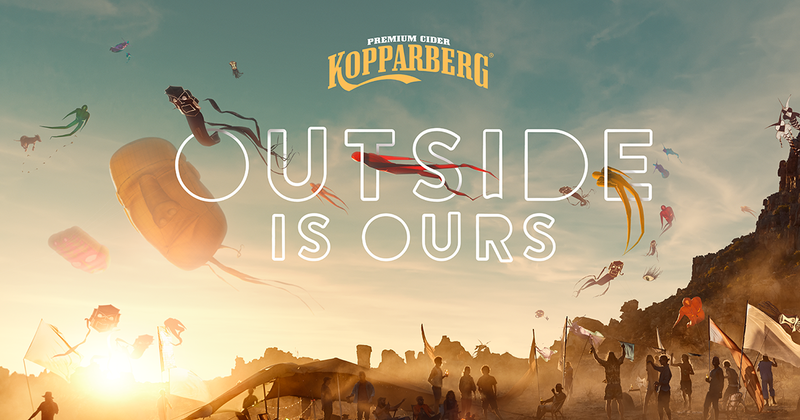 We will also be hosting our new experiential platform, The Kopparberg Outsider, at various festivals across the UK, alongside a series of social activations. The Kopparberg Outsider will see specially curated line-ups, secret performances and new Kopparberg Black draught on tap at Lovebox, Citadel and Sundown alongside favourites Strawberry & Lime, Mixed Fruit and Pear. The Kopparberg Outsider will also be heading to We Are Fstvl.